Featuring over 70 cycling-specific exercises in full anatomical detail, Cycling Anatomy provides you with a unique approach to training. 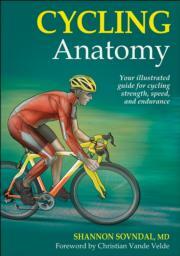 This book tells and shows you, in detail, how each exercise is directly linked to performance on the bike. This is the ultimate training guide to help you build an effective and injury-free cycling program. Cycling Anatomy goes beyond exercises by placing you on the bike and into the throes of competition. Illustrations of the active muscles involved in cornering, climbing, descending, and sprinting show you how the exercises are fundamentally linked to cycling performance. From steep inclines to slick terrains, Cycling Anatomy will ensure you’re prepared for any challenge that comes your way. You’ll also learn how to modify exercises to target specific areas, reduce muscle tension, and minimize common cycling injuries. You’ll also learn ways to pull it all together to develop a training based on your individual needs and goals. Whether you’re training for an upcoming century ride or just want to top that killer hill with strength to spare, Cycling Anatomy will make sure you get the most out of every ride. Shannon Sovndal, MD, is the owner and founder of Thrive Health and Fitness Medicine (Thrive HFM), an elite team of physicians, exercise physiologists, and athletes who provide clients with the highest level of personalized health care, life management, and fitness training. Most recently, he serves as a team physician for the Garmin-Slipstream professional cycling team. He also works as a board-certified emergency medicine physician at Boulder Community Hospital in Colorado and as a physician at the General Clinical Research Center at the University of Colorado. Before becoming a physician, Sovndal raced road bikes in the United States, winning the California/Nevada District Championship and many other road races and criteriums. Sovndal is a coauthor of Fitness Cycling and has written numerous sports-related articles and lectured on exercise-related topics. He attended medical school at Columbia University in New York, completed his residency at Stanford University in California, and now lives in Boulder, Colorado. "Cycling Anatomy answers the basic and complex questions and gives you an array of options for improving your training both on and off the bike."